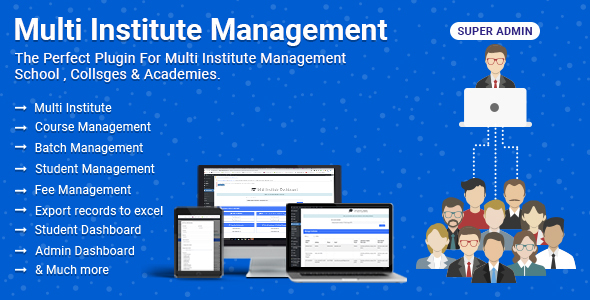 Multi Institute Management is a comprehensive plugin to manage the multiple and single institute related activities such as courses, batches, enquirers, registrations, fees, students, staff etc. It can generate fee receipt, fees report, ID card, completion certificate etc. in a printable format. Administrators can be assigned to manage particular records. Also, you can send Email and SMS notifications to students by batch, course, pending fees and more. Students can pay their fees with PayPal or Razorpay payment methods. Multi Institute Managemen can provide the 4 dashboards to manage the institute activity. 1. Super admin => It can manage the all institutes as list wise and create, view and modify all details of the institutes. 2. Admin Dashboard => In this dashboard user can manage the single Institute all activity. 3. Staff Dashboard => Staff can do all activity of institute assign by admin. 4. Student dashboard => Student can view Notices, Study Material, Exam results, Pending Fees and Deposit the pending via Payment Getaway.